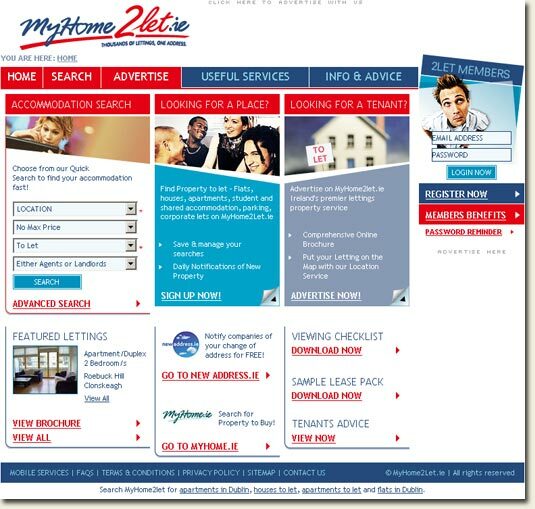 Back in 2006 one of Ireland’s largest Internet acquisitions saw Ireland.com, the web property of The Irish Times newspaper, purchase MyHome.ie for a reported $65m. I covered the story here. MyHome.ie is (apparently) an extremely profitable property (real-estate) website. In case your wondering what all that code does, well it does what should have been accomplished in about 10% of that mark-up. It instructs the browser, in the most convoluted way possible, how to handle the primary navigation links that you can see in the image. Crazy stuff, Richard. It’s also quite shocking to see how Google is indexing the site. Why?! There’s a certain type of smartass that has to reinvent the wheel with everything he touches. He’s usually very intelligent but thinks he has to prove himself with extreme complexity in his work. I think he got to work on MyHome2Let.ie. Let.ie does something similar. It uses POSTs from the search results to the individual property pages — it means you can’t grab links to interesting places and IM/email them to your flatmate. Annoying. Daft.ie really sets the standard, being ultra friendly — even providing “shortcodes” — shortened links with numeric IDs. Wow that is shocking… good find. When I visit a site like that, I end up with 24 blank tabs open, and no new content. Good blog btw, I meandered here from NBD, I’ll be sure to stick around. Also completely inaccessible to people using ATs such as screen readers. I have new appreciation of sites that degrade gracefully now that I use opera browser on my phone a lot. Google mail works great but not calendar yet alas. Just curious as to who is the ‘he’ you refer to Eoghan? LT: Nah, no inside information. I just know a few guys like this and they do exactly the kind of thing we’re looking at here.